Keras holds a significant interest in Calidus Resources Ltd, an ASX listed company, which is exploring and developing the Warrawoona Gold Project, which is located in a significant gold belt in the East Pilbara District of the Pilbara Goldfield of Western Australia. The Warrawoona Gold Project is situated in the East Pilbara district of the Pilbara Goldfield of Western Australia, approximately 150km south east of Port Hedland and approximately 25km south east of the town of Marble Bar. Historically fragmented ownership has held back development of the area but Calidus has now built a significant land package to control the well-mineralised Warrawoona Gold Belt. There is currently a dislocation in the Keras market capitalisation compared to the see-through valuation from its interest in Calidus. See valuation comparisons in Project Value below. 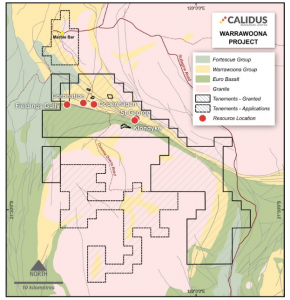 Calidus is seeking to rapidly advance Warrawoona by way of a major drilling and exploration programme and feasibility studies, with an initial focus on Klondyke. Keras currently holds 458m shares in Calidus which represents approximately 35.8% of the Company. Keras also holds an additional 265m Performance Shares in Calidus, which will be issued on the successful completion of a Preliminary Feasibility Study. Keras acquired the Klondyke Project in October 2016 and through a combination of debt and equity financing undertook a confirmatory drilling campaign in the first half of 2017. The confirmation of high-grade intersections and mineralised continuity led to the successful listing of Calidus Resources Ltd on the ASX in June 2016. On listing Keras was issued 217m ordinary shares in Calidus and two tranches of Performance Shares of 265m and 241m each with attached milestones. All shares are in escrow until 23 June 2019. The first tranche of Performance Shares, totalling 265m shares in Calidus, were issued on 18 December 2017 following the publication of a total Mineral Resource at the Warawoona Project, of 10.5 Mt at a grade of 2.11 g/t Au containing 712,000oz Au. Sale of all or part of the Warrawoona Gold Project for a cash consideration of at least $50,000,000. The chart below shows the disconnect in value between the Keras market capitalisation and the see-through value of the Company’s holding in Calidus. This chart illustrates the upside potential in the Keras share price due to the lag in performance relative to Calidus.